Strength training and neuromuscular electrical stimulation (NMES) are effective training modalities for improving muscle function, exercise performance and health status in individuals with COPD. The aim of the present study was to analyze the metabolic load of these training modalities at baseline, half-way, and at the end of an eight-week interdisciplinary pulmonary rehabilitation program in a subgroup of individuals with COPD of the DICES trial. Of 24 individuals with COPD (FEV1: 34 ± 2% predicted, men: 58%, age: 66 (61–68) years), peak oxygen uptake (VO2), peak minute ventilation (VE), heart rate, oxygen saturation and symptom scores were assessed during HF-NMES (75 Hz), LF-NMES (15 Hz) and strength training at three moments during their pulmonary rehabilitation program. Intervention-related peak VO2 did not change over time during HF-NMES, LF-NMES or strength training. Intervention-related peak VE did not change over time during strength training or LF-NMES and increased slightly, but significantly over time during HF-NMES. Peak VO2 and VE were significantly higher during strength training compared to HF-NMES or LF-NMES. Oxygen saturation significantly decreased after the first measurements during HF-NMES and strength training group to baseline, while no significant changes in oxygen saturation were observed during the other measurements. Heart rate significantly increased compared to baseline in all groups at all moments and was significantly higher after strength training compared to HF-NMES or LF-NMES. Median end scores (points) for dyspnea, fatigue and muscle pain ranged from 1 to 3, from 0.5 to 2 and from 0 to 6 after HF-NMES, from 2 to 3, from 2 to 5 and from 0 to 9 after LF-NMES and from 2 to 5, from 1.5 to 4 and from 0 to 28 after strength training respectively. To conclude, the metabolic load and symptom scores remain acceptable low over time with increasing training loads during HF-NMES, LF-NMES or strength training. Individuals with chronic obstructive pulmonary disease (COPD) may suffer from lower-limb muscle weakness and poor exercise capacity, in particular those with severe to very severe dyspnea [1–3]. This is most probably due to reductions in weight-bearing daily physical activities . Therefore, an exercise-based pulmonary rehabilitation program may be beneficial . Severely dyspneic individuals with COPD (i.e., modified MRC dyspnea grade 3 or 4), however, are less likely to complete a pulmonary rehabilitation program . This may be due to exercise-induced dyspnea, particularly during whole-body endurance training . Therefore, strength training  or transcutaneous neuromuscular electrical stimulation (NMES) [9, 10] may be preferential alternative rehabilitative modalities for severely dyspneic individuals with COPD [11, 12]. These interventions are safe and effective in severely dyspneic individuals with COPD and quadriceps muscle weakness at baseline . Indeed, lower-limb muscle function, functional exercise performance, problematic activities of daily life, mood status, and health status improved significantly following eight weeks of strength training, high-frequency (HF, 75 Hertz) NMES, or low-frequency (LF, 15 Hertz) NMES . A major advantage of strength training and NMES is the relatively low metabolic load (e.g., the intervention-related peak oxygen uptake (VO2) and ventilation (VE)), accompanied with relatively low dyspnea symptom scores [14, 15]. The metabolic load during multiple successive sessions of strength training has been reported once in 11 individuals with COPD . The leg press strengthening exercise increased significantly during a 12-week pulmonary rehabilitation program (+43% of baseline training load), accompanied by a significant increase in metabolic load over time (+23% of baseline intervention-related peak VO2; +18% of baseline intervention-related peak VE) . The metabolic load during a session of high-frequency (HF) or low-frequency (LF) NMES has only been measured cross-sectionally [14, 15]. Whether and to what extent the metabolic load will remain stable over time while the NMES pulse amplitude is expected to increase  remains currently unknown in individuals with COPD. Moreover, the actual course of NMES pulse amplitude has never been described in individuals with COPD. This, however, will provide a better insight in the feasibility and efficacy of these types of local muscle training. The aim of the present study was to analyze the metabolic load of the different local muscle training modalities at baseline, half-way, and at the end of the eight-week program in a subgroup of individuals with COPD who participated in the DICES (Dyspneic Individuals with COPD: Electrical stimulation or Strength training) trial. A priori, we hypothesized that individuals with COPD are able to increase the strength training load or NMES pulse amplitude (irrespective of stimulation frequency), while the metabolic load will remain stable compared to baseline. In the DICES trial, individuals with COPD with mMRC dyspnea grade 3 or 4 , and quadriceps weakness  were randomly assigned to lower-limb HF-NMES (75 Hertz), lower-limb LF-NMES (15 Hertz), or lower-limb strength training (leg extension strengthening exercise, and leg press strengthening exercise [8, 18]). These interventions took place in group sessions, twice per day, 5 times per week for 8 weeks. All sessions were supervised by a physiotherapist. The interdisciplinary treatment was identical for all participants, and treadmill walking or stationary ergometry cycling was not applied during the trial. Symptom scores for dyspnea, fatigue, and muscle pain were assessed before and after each session . The Medical Ethical Committee of the Maastricht University Medical Centre + (MEC 09-3-072) approved this trial, which conformed to the principles outlined in the World Medical Association declaration of Helsinki which was revised in Seoul . Details of the trial were registered at http://www.trialregister.nl NTR2322) before first subject enrolment. All patients gave written informed consent to participate in the study and a subgroup additionally gave written informed consent to undergo the measurements of the metabolic load. Some of the baseline findings, and the efficacy data of the DICES trial have been published before [21, 22]. Please, see Additional file 1 for all details. Outcome assessors were blinded for treatment allocation. The investigators supervising the interventions (MJHS, AWV) were blinded for the initial results, and were not involved in the outcome assessment. Participants were instructed to not divulge their group allocation. Participants, who were randomly assigned to one of the NMES groups, were blinded for the type of stimulation frequency. Quadriceps muscle function (i.e., peak muscle strength and muscle endurance), using a Biodex (Biodex System 4 Pro, Biodex Medical Systems, Inc., New York, USA). Quadriceps peak muscle strength (Newton-meter, Nm) and quadriceps muscle endurance (Joules, J) were measured isokinetically. The participants performed thirty volitional maximal contractions at an angular velocity of 90° per second. See Additional file 1 for all details concerning the interventions. Functional exercise performance was measured with the 6-min walk test, including a practice walk at initial assessment . The best 6-min walk distance (6MWD) was used for further analyses. The constant work-rate cycling endurance test (CWRT, expressed in seconds) was performed at 75% of the pre-determined peak cycling rate, which has a high reliability in individuals with COPD . Symptom scores for exercise-induced dyspnea and fatigue were assessed before and after these exercise tests. Continuous on-line calculations of breath-by-breath oxygen uptake (VO2) and minute ventilation (VE), heart rate and oxygen saturation were obtained using the Oxycon mobile, a portable metabolic system (Carefusion the Netherlands, Houten, the Netherlands). The metabolic load was measured during sessions of HF-NMES, LF-NMES, or strength training in the first week, the fourth week, and in the last week of the trial. This methodology has been used before in individuals with COPD [14, 15]. See Additional file 1 for all details concerning the measurement of the metabolic load. Analyses were performed using SPSS for Windows, Version 17.0.1 (SPSS, Inc., Chicago, Il, USA). Descriptive statistics were presented as median and interquartile range unless otherwise stated. Differences within groups were analyzed using Wilcoxon signed rank test. Groups were compared using Mann–Whitney U test or Kruskal-Wallis one-way analysis of variance. All tests were two-sided using a significance level of 5%. Of the 120 individuals who participated in the DICES trial, 61 individuals (51%) were ineligible for the additional metabolic data collection due to the use of long-term oxygen therapy. Moreover, 26 individuals (22%) did not consent to this extra set of tests and 3 individuals (2%) who gave informed consent withdrew before start. At baseline, from 30 individuals (25%) intervention-related peak VO2, VE, heart rate and oxygen saturation were obtained. From 24 individuals the metabolic load was measured during a session of HF-NMES (n = 9), LF-NMES (n = 7), or strength training (n = 8) in the first week, the fourth week, and in the last week of the trial (Figure 1). Flow diagram of measurements metabolic load. The 24 individuals of this pre-specified sub-analysis had severe to very severe COPD, a poor diffusing capacity for carbon monoxide and a poor functional and peak exercise performance (Table 1). Besides age and the relative peak ventilation during the cardiopulmonary exercise test, baseline characteristics did not significantly differ between intervention groups (Table 1). Mean FEV1 (34 ± 2% versus 31 ± 1% pred), PaCO2 (5.2 ± 0.1 kPa versus 5.8 ± 0.1 kPa), fat-free mass index (17.2 ± 0.4 kg/m2 versus 16.3 ± 0.2 kg/m2) and total work (1389 ± 95 J versus 1122 ± 49 J) were significantly higher in the metabolic load group compared to the remaining group, other baseline characteristics (age, DLco, residual volume, PaO2, SO2, peak and functional exercise performance, body mass index, peak torque, HADS anxiety and depression and health status) were not significantly different between both groups (Additional file 1: Table S1). Values expressed as median (interquartile range) or numbers. Data are compared between HF-NMES, LF-NMES and strength training. Abbreviations: HF-NMES = High-frequency transcutaneous neuromuscular electrical stimulation; LF-NMES = Low-frequency transcutaneous neuromuscular electrical stimulation; M = males; F = females; FEV1 = forced expiratory volume in one second; VC max = maximum vital capacity; DLCO = diffusion capacity of the lung for carbon monoxide; RV = residual volume; PaO2 = resting arterial oxygen tension; PaCO2 = resting arterial carbon dioxide tension; SaO2 = resting arterial oxygen tension; kPa = kilopascal; LTOT = long-term oxygen therapy; GOLD = Global Initiative on Obstructive Lung Diseases; BMI = body mass index; FFMI = fat free mass index; kg/m2 = kilogram per square meter; VO2 = oxygen uptake; tSaO2 = transcutaneous oxygen saturation; ml/min = milliliters per minute; % MVV = percentage maximal voluntary ventilation; bpm = beats per minute. Isokinetic quadriceps peak torque increased significantly following HF-NMES (12.6 Nm (3.0-17.5 Nm); p = 0.021), but not following LF-NMES (4.2 Nm (−5.2-5 Nm); p = 0.866) or strength training (5.7 Nm (−9-22 Nm); p = 0.263) (Figure 2). There were no significant between-group differences in changes. Individual changes in quadriceps peak torque and total work from baseline to end. Abbreviations: HF-NMES=high-frequency transcutaneous neuromuscular electrical stimulation; LF-NMES=low-frequency transcutaneous neuromuscular electrical stimulation (quadriceps peak torque: A, B and C; quadriceps muscle endurance: D, E and F). The bold line represents the median values. Isokinetic total work increased significantly following HF-NMES (292 J (156–501 J); p < 0.01), but not following LF-NMES (12 J (−73-178 J); p = 0.499) or strength training (157 J (−185-456 J); p = 0.263) (Figure 2). The improvement following HF-NMES was significantly higher compared to LF-NMES (p = 0.005) (Figure 2). 6MWD improved significantly following HF-NMES (75 m (29–138 m); p = 0.008) or strength training (57 m (32–85 m); p = 0.034), but not following LF-NMES (27 m (−34-65 m); p = 0.310). There were no significant differences in changes between groups. Endurance time during the constant work-rate cycling test improved significantly following HF-NMES (92 s (49–275 s); p = 0.066), LF-NMES (83 s (−7-223 s); p = 0.091) or strength training (37 s (1–98 s); p = 0.043). There were no significant differences in changes between groups. In the HF-NMES group, pulse amplitude ranged from 12 to 40 mA in week one to 34 to 71 mA in week eight (p = 0.008); and in the LF-NMES group from 25 to 50 mA to 35 to 98 mA (p = 0.063, Figure 3). Median end dyspnea scores, end fatigue scores and end muscle pain scores ranged from 1 to 3 points, from 0.5 to 2 points and from 0 to 6 points in the HF-NMES group and from 2 to 3 points, from 2 to 5 points and from 0 to 9 points in the LF-NMES group respectively. The load during leg extension strengthening exercise ranged from 2.5 to 20 kg in week one to 12.5 to 27.5 kg in week eight; and from 5 to 70 kg to 35 to 90 kg for the leg press strengthening exercise (both p < 0.02, Figure 3). In addition, median end dyspnea scores, end fatigue scores and end muscle pain scores ranged from 2 to 5 points, from 1.5 to 4 points and from 0 to 28 points in the strength training group. 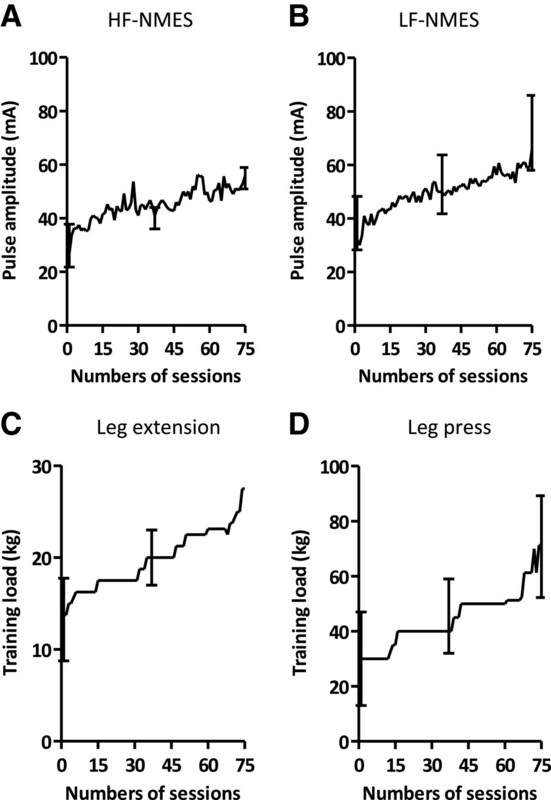 Course in pulse amplitude and training load during the rehabilitation program. Course in pulse amplitude is shown during HF-NMES (A) and LF-NMES (B). Course in training load is shown during leg extension exercise (C) and leg press (D). Data are shown as median and interquartile range. Abbreviations: HF-NMES=high-frequency transcutaneous neuromuscular electrical stimulation; LF-NMES=low-frequency transcutaneous neuromuscular electrical stimulation. Intervention-related peak VO2 did not change over time all three interventions (Figure 4A, Table 2). Intervention-related peak VE did not change over time in the strength training or LF-NMES group (p > 0.171). In the HF-NMES group, the intervention-related VE increased slightly, but significantly over time (p = 0.012, Figure 4B). At all measurement points, intervention-related peak VO2 and VE were significantly higher during strength training sessions compared to the HF-NMES or LF-NMES sessions (all p < 0.05). 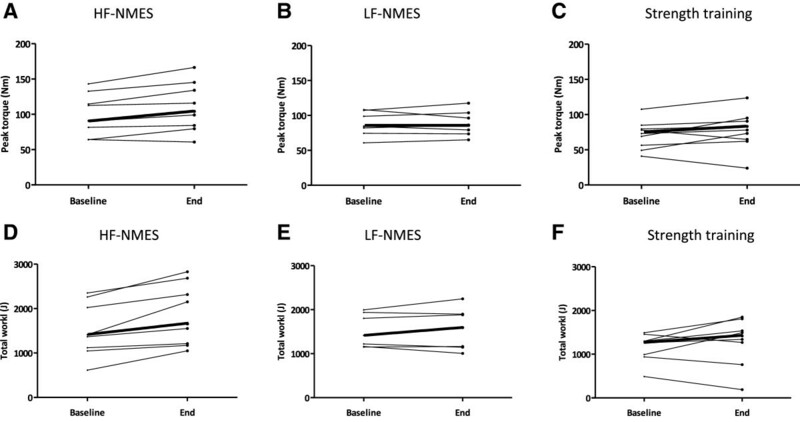 There were no differences between HF-NMES and LF-NMES (p > 0.28). Oxygen saturation (lowest values) was significant lower at the end of the fist measurements in the HF-NMES group and the strength training group compared with baseline (both p < 0.03), during the other measurements no significant changes in oxygen saturation were observed (all p > 0.05) (Table 3). There were no significant between-group differences in changes in oxygen saturation (all p > 0.05). Heart rate was significantly higher at the end compared to baseline in all groups in all measurements (p < 0.05) (Table 3). During all measurements, changes in heart rate were significantly higher after strength training compared to HF-NMES or LF-NMES (p < 0.04). 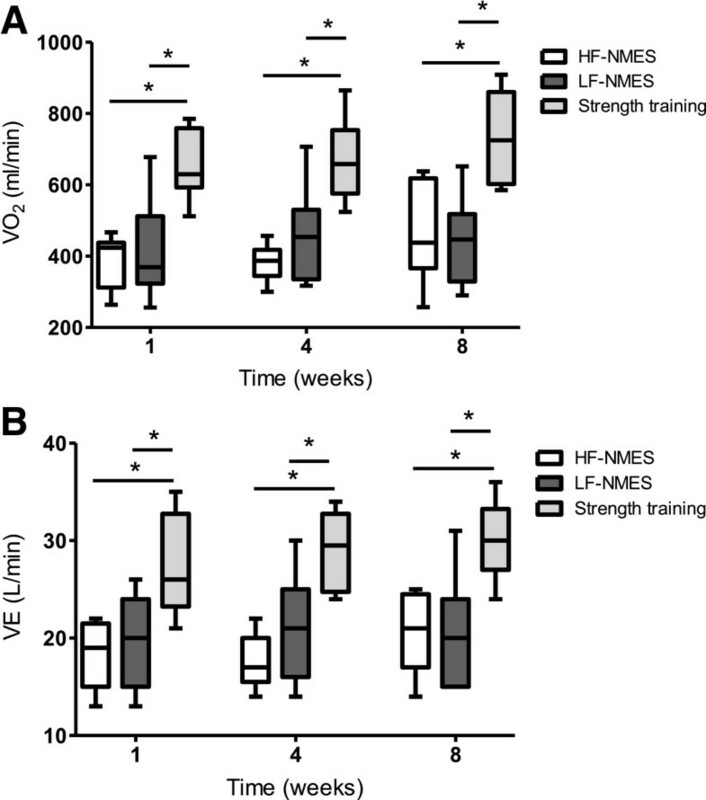 Course in VO 2 and ventilation during HF-NMES, LF-NMES and strength training. Course in VO2 is shown in A and course in ventilation (VE) is shown in B. Data are shown as median and interquartile range. Abbreviations: HF-NMES=high-frequency transcutaneous neuromuscular electrical stimulation; LF-NMES=low-frequency transcutaneous neuromuscular electrical stimulation; VO2=oxygen uptake. *p<0.05. Values expressed as median (interquartile range). Abbreviations: HF-NMES = high-frequency transcutaneous neuromuscular electrical stimulation; LF-NMES = low-frequency transcutaneous neuromuscular electrical stimulation; VO2 = oxygen uptake; VE = ventilation; ml/min = milliliters per minute; L/min = liters per minute. Abbreviations: HF-NMES = high-frequency transcutaneous neuromuscular electrical stimulation; LF-NMES = low-frequency transcutaneous neuromuscular electrical stimulation; SpO2 = oxygen saturation; bpm = beats per minute. This is the first study to investigate the metabolic load of various local muscle training modalities in severely dyspneic COPD patients with quadriceps muscle weakness during the course of an inpatient pulmonary rehabilitation program. It showed that the metabolic load measured during successive sessions of strength training, HF-NMES, or LF-NMES remained generally stable, while the NMES pulse amplitude or the strength training load increased significantly during the eight-week intervention period. The median oxygen uptake during the baseline session of HF-NMES, LF-NMES or strength training ranged between 30 and 99% of the peak aerobic capacity measured during the cardiopulmonary exercise test, and was comparable with previous studies [7, 14, 15]. The median oxygen uptake was 99% of the peak aerobic capacity in one subject who was characterized with very severe COPD (FEV1: 17% pred) and a very decreased exercise capacity (peak load: 20% pred; VO2 peak: 688 ml/min (26% pred)). At all measurement points, intervention-related peak VO2 and VE were significantly lower during NMES (LF and HF) compared with strength training. This is in line with previous studies measuring the metabolic load in patients with COPD during NMES or strength training [14, 15]. However, these results are in contrast with the findings of a study in healthy male recreational athletes comparing one session of voluntary contractions with one session of HF-NMES (75 Hz) . Theurel and colleagues found that the average oxygen consumption and ventilation were significantly higher during HF-NMES compared with voluntary exercise . Besides the study design and subjects, an important difference with the present study is the training load . Theurel and colleagues used an average training load in strength training of 46% of the maximal voluntary contraction instead of 60-70% of the one-repetition maximum which is used in our study and what is recommended by the American College of Sports Medicine . The present study shows no changes over time in the metabolic load which is not in line with the study of Probst and colleagues . Probst and colleagues showed a significant increase in oxygen uptake and ventilation during a 12 wk program of leg press exercises . This could be attributable to a greater increase in the training load. However, the change in training load of leg press exercises was comparable to the present study. The median increase in pulse amplitude during the study was 24 mA in HF-NMES and 37 mA in LF-NMES. The course in pulse amplitude is comparable with previous studies in severely disabled patients with COPD which respond to NMES [16, 26]. The low metabolic load accompanied with acceptable low dyspnea and fatigue scores probably explains the applicability of these interventions in severely disabled and dyspneic patients, even during acute COPD exacerbations [26–28]. This is also probably the reason that NMES can easily be applied in bed-bound individuals with chronic hypercapnic respiratory failure due to COPD who are receiving mechanical ventilation  or critically ill patients in the intensive care unit . Because of the constant metabolic load in combination with stable symptom scores over time, it seems reasonable to hypothesize that the improvements in muscle function are at least partially due to intramuscular changes. Previously, it has been shown that type I and IIa fibers increased following LF-NMES [31, 32] or HF-NMES [33, 34]. Strength training generally results in increased levels of glycolytic enzymes  and an increase in percentage and size of type II fibers [36–39]. Obviously, this study has some limitations. First, the inclusion criteria of the DICES trial limits the external validity of the present findings. Only COPD patients with an mMRC score of 3 and 4 in combination with muscle weakness were included. 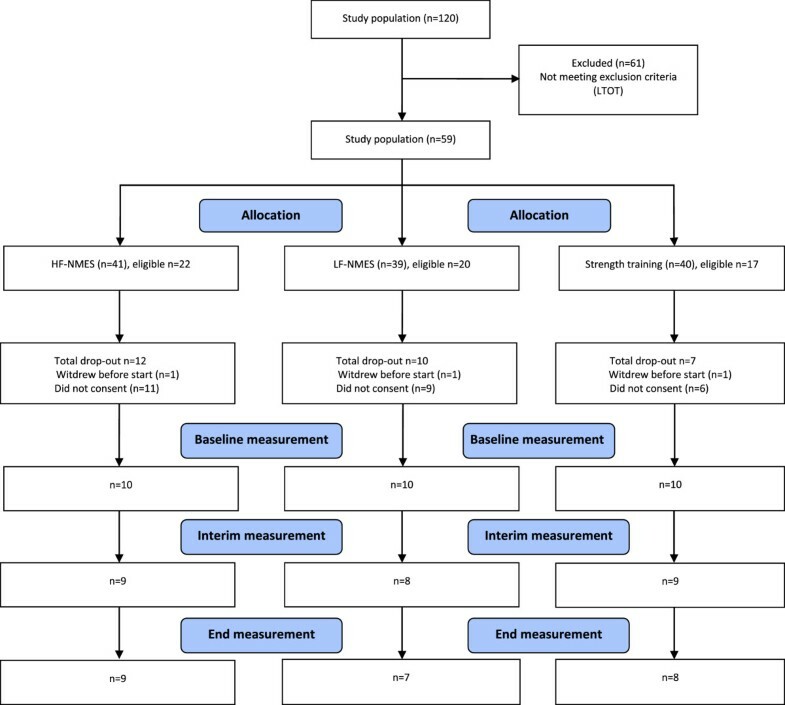 Secondly, the small sample size and selected patient characteristics for participation in the measurements with the Oxycon mobile may be an important reason for detecting no significant improvements in peak muscle strength in the strength training group and quadriceps muscle endurance in the LF-NMES group and the strength training group. Only patients without long-term oxygen therapy (LTOT) were eligible to participate due to the methodology used , although LTOT patients are also likely to have benefit from these interventions. However, the equipment (Oxycon mobile, a portable metabolic system) is not able to measure oxygen uptake (VO2) while breathing inspiratory O2 fractions . In the DICES trial 51% of the patients used LTOT . It is unclear if the metabolic load might be different in LTOT patients. Moreover, the small sample size and the exclusion of LTOT patients may limit the external validity and broad applicability of these findings. To conclude, the metabolic load and symptom scores for dyspnea, fatigue and muscle pain remain acceptable low over time with increasing training loads during HF-NMES, LF-NMES or strength training. For this reason, these interventions are recommended in severely dyspneic patients with COPD for improving their muscle function and exercise performance. The present authors are grateful to the patients who volunteered in the DICES trial. The authors also thank Martijn Cuijpers and Martyna Renckens for their valuable help. This research was supported by grants from the Lung Foundation, Leusden, the Netherlands, Grant 3.4.09.024 and the Weijerhorst Foundation, Maastricht, the Netherlands. Study concept and design: MJHS, EFMW and MAS; acquisition of data: MJHS, JMLD, AWV; analysis and interpretation of data: MJHS, FMEF and MAS; drafting the article: MJHS, FMEF and MAS; revising it critically for important intellectual content: all authors; final approval of the version to be published: all authors. MJHS had full access to all study data and takes responsibility for the integrity of the data and the accuracy of the data analysis.